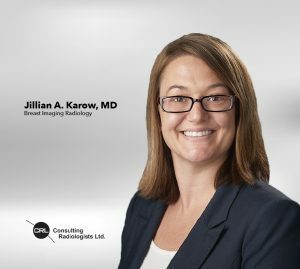 Dr. Jillian Karow joins Consulting Radiologists, Ltd as a Breast Imaging Radiologist. Dr. Karow is originally from Spring Lake Park, MN and moved to Chicago, IL where she earned her medical degree and completed her residency in Diagnostic Radiology at the University of Illinois-Chicago. Her fellowship in breast imaging was completed at the University of Wisconsin-Madison in Madison, WI. When not at work Dr. Karow enjoys spending time outdoors with her husband and three daughters. She likes to try new food as well as attempting to cook new dishes. She also enjoys painting and crafts.